Hmm...I wonder why they're apologizing ahead of time? (Gomen also means "sorry" in japanese.) Could this be a bad sign?? And the answer is...YES!!!! Literally and figuratively! Let's get straight to it folks. 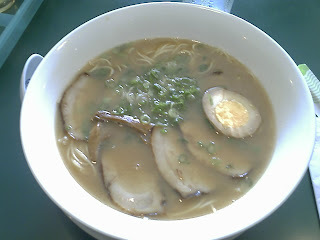 Tonkotsu-Shoyu-ramen: Submerged in this murky bowl of shoyu flavored tonkotsu ramen, lives a slithering noodle creature that can only be described as...odd. What is this flavor I'm tasting? The soup is extremely unusual, confusing my taste buds with that crinkling forehead sensation. The noodles were even worse! Claimed to be homemade and fresh, I couldn't grasp why I kept tasting charcoal with every slurp. I wouldn't go as far as saying "don't go" to this place, after all we are called GO RAMEN!, but I'm not sure if I can accept their apology. If there's anyone out there that can change my mind about this, please let me know what I need to try! 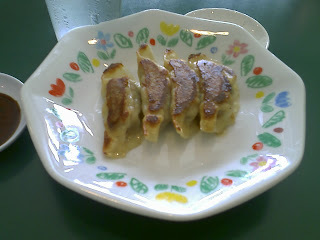 Gyoza: Lightly burnt to a crisp (the way I like it), the gyoza was a bit more familiar to my taste buds. But it still couldn't fix the damage done by the ramen oddity. And what's with that plate?! welcome to our little online ramen community! your posts, like ed's, make me realize that i need to catch up on a whole lot of slurping down in orange county!